If you are looking for a keyboard shortcut to highlight a cell with a color, I have a bad news for you, you won’t find any. But, as in many other cases, there are workarounds which will help you deal with this problem. Below, are a few methods to achieve the desired effect. The first method is not the standard keyboard shortcut, rather a way to control the ribbon with a keyboard. In this method, you press Left Alt, release the button, then press the H button twice. It won’t highlight a cell but will open the menu, where you will be able to choose your color with a mouse or keyboard arrows. There is another, faster way to access Theme Colors. 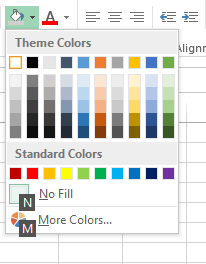 You can add a new Fill Color icon on the first position in the Quick Access Toolbar. If you don’t know how to do it, read this lesson. You can use F4 to repeat the last action. So if you’ve just changed the background color of a cell, you can use this shortcut to fill the next cell. In the above example, we filled cell B2 with a color, then used the F4 keyboard shortcut to fill cell D2. The last keyboard shortcut I would like to present is the one assigned by you to a macro. The fastest way to create a macro is to use the little icon in the bottom left corner of the worksheet. When a new window appears, choose a name for a new macro, but more importantly choose a keyboard shortcut. Let’s say that we want Ctrl + Shift + Q to be our shortcut. 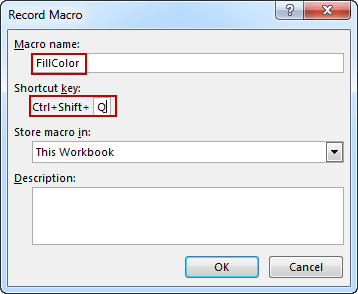 In order to assign it to the macro place your cursor in the Shortcut Key area and press Shift + Q. When you click OK, the macro starts to record your movements. Now, you need to fill any cell with the desired color and click the Stop Recording button. Click any cell and use Ctrl + Shift + Q to fill it with color. You can use keyboard shortcut without the shift key, but you have to remember that many shortcuts in Excel are, by default, assigned to other tasks. If you use, for example, the Ctrl + C than its default task (copying) will be replaced by filling a cell with a color, so it’s probably safer to use a bit more complicated shortcuts.